Three Great Points in Erik Palmer's "Effective Communication" Video - Dave Stuart Jr. I've written about Erik Palmer's work before (remember PVLEGS? ), and I'm working through his latest book Teaching the Core Skills of Listening and Speaking. But recently, I found something else of his that's totally free and pretty powerful. It's a video called “Effective Communication,” and while I'd encourage you to click here to watch it yourself, I thought I'd share three points from it that I love just in case you don't have the time right now and want a “SparkNotes” version. If nothing else, I want to remember these points for my own instruction as a world history and English teacher. I've written about this before, but it's important enough to say again: we can no longer let speaking and listening sit on the back burner (or, as Erik says in the video, we can no longer let it sit somewhere behind the stove) if we're truly interested in the long-term flourishing of our kids. If you teach ELA — make speaking and listening a regular part of curriculum, instruction, and assessment. If you teach science — make speaking and listening a regular part of curriculum, instruction, and assessment. If you teach social studies — make speaking and listening a regular part of curriculum, instruction, and assessment. If you teach math — make speaking and listening a regular part of curriculum, instruction, and assessment. Even “non-core” subjects like art, music, and PE could incorporate some discipline-specific speaking and listening. But, you ask, what about the shy kids? Erik says that we as teachers have done a great job supporting the notion that one of the biggest fears people have is public speaking. But, as Erik asks in Well Spoken, has anyone ever actually died from it? Instead of adding to the hype around scary public speaking, Palmer says we need to recognize that all kids have strengths and weaknesses — for some it's math, for others it's art — and speaking in public is just one more area folks can be weak in. But, you might say, public speaking is different! There's fear involved! And that fear comes from a fear of failure or a fear of looking silly. Aren't those fears often the same for the kid who's weak in physical education or the kid who's weak in science? The solution, then, to a fear of public speaking is simply ensuring that every kid speaks, every day, through strategies as simple as poker chip discussions (discussed in the video) or using index cards to randomly call on students. When we emphasize speaking as a regular part of our curriculum, instruction, and assessment, Palmer claims, the stakes get lowered and it's not all about the one big speaking assessment coming at the end of Unit 4. If you've been around for a bit, you'll know that normalizing speaking is one of six elements in the non-freaked out approach to literacy instruction. Instead of each of us making up what we think great speaking is, Palmer says we need to use a common language both across and between grade levels so kids can internalize what makes great speaking and so they actually have a chance to become good at a concrete set of skills. I'm fully with him there — we owe students simplified, powerful frameworks for the things most likely to make them flourish. 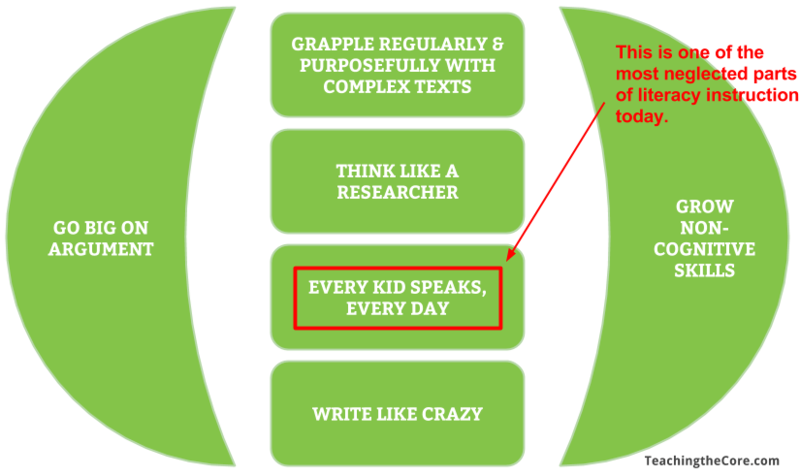 That's what the non-freaked out approach (pictured above) attempts to do — and, within Every Kid Speaks, Every Day, you can bet I'll be using Palmer's language (screenshot below). I've not done a great job using Palmer's Building a Speech language, but I was consistent with PVLEGS this past year, and I predict it will transfer with many of my students into their sophomore year. I would love to see it used consistently throughout my school someday just to see what a difference it might make. My prediction is that, if these simple points were taken to heart by an entire school, you'd find something pretty strange in America: a large group of diverse people who all find “a fear of public speaking” to be utterly overhyped. Great post, Dave! Palmer makes so many important points. I’m fascinated with the idea that so much of our critiquing of students’ reading and writing is accepted as common place but the critiquing of their speaking is so often taboo. Would love to hear your thoughts on taking speaking and listening one step further and addressing the skills of classroom conversation and discussion. Hi Dave, some very important tips and topics. Building and going big on argument is a very important tip so thank you very much.